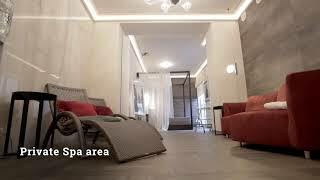 Unique design apartments from 70 to 160 sq.m., situated in the very heart of Karlovy Vary, in a historical building opposite the mineral springs. Rubin Luxury Apartments ***** is 7 uniquely decorated apartments and a spacious spa area. The apartments are located opposite the Mill Colonnade (less than 30 seconds walk). The apartments are equipped with all the necessary premium-class appliances, fully equipped kitchen, air-conditioning system, fast internet. All colonnade view apartments have balconies. Apartments guests have free access to a 24-hour spa area with saunas, a relaxation zone and a terrace. The apartments are truly exclusive offer for luxury connoisseurs. Rubin Luxury Apartments ***** offers apartments with 3 separate bedrooms. An excellent option for a big family or company. Whatsapp concierge service is available for guests. There is a premium supermarket and a coffee shop on the ground floor.